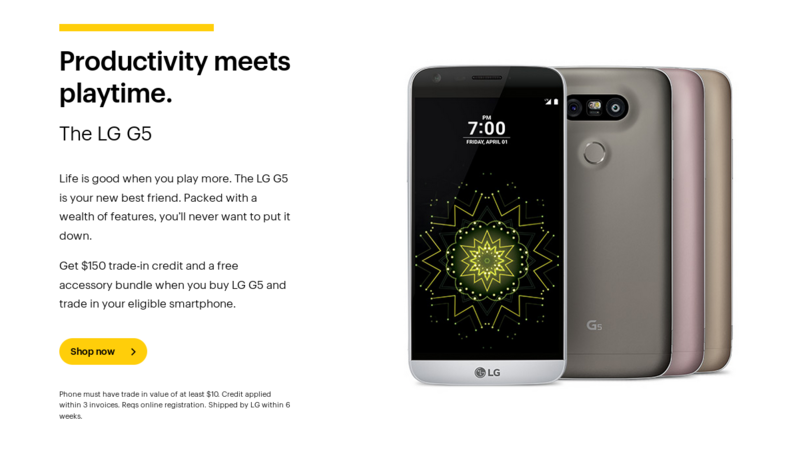 We've already told you about the LG G5 being available from AT&T for $688. And if you've been following the coverage, you know it was only a matter of time before the phone went live on other carriers' sites too. Well, it has. The G5 is now ready for purchase from all five major carriers in the US. Now, those of you who aren't tied down to any specific network will have quite the variation in prices to consider. T-Mobile is offering the G5 for $629.99. Verizon wants $624. US Cellular customers who don't sign the $199.99 two-year contract can get the phone for $584. Sprint is the lowest of the pack at $576. The carriers come with different perks. Sprint will slip you $150 in credit if you trade in an eligible phone. T-Mobile will provide a free LG 360 camera. Verizon is offering a free battery and battery cradle. AT&T, as a reminder, will give you a discount if you also also buy a Watch Urbane 2nd Edition or G Pad X 10.1. T-Mobile offers the phone in silver and gold. Verizon has silver and gray. The rest let you pick from silver, gold, gray, and pink. Going off David's review of the G5, this may not be the best flagship of the year. But everyone has different interests and expectations. If this is the phone for you, you know what to do.